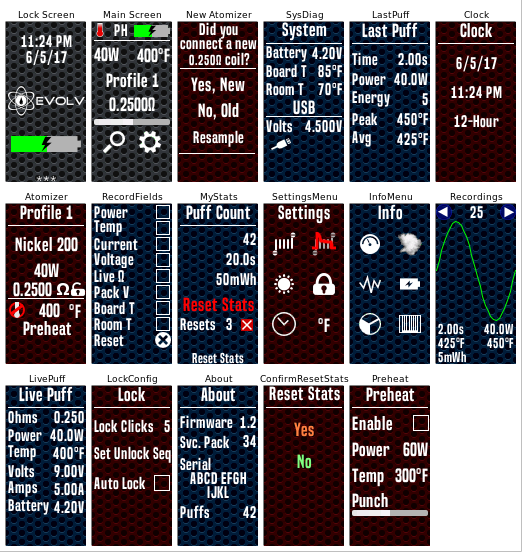 I made to be usable for you lot and to see how you can use conditions, gauges, toggles etc work as making themes has a significant learning curve. As a quick start base for you to use and abuse, no rights claimed use/share any of it. Looking forward to far more beautiful theme from you lot. Clicking the profile name on the main screen takes you to atty setting. 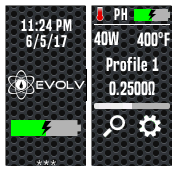 Clicking on the profile name in the atty screen let you change profile. 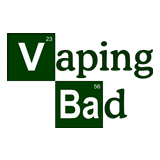 Clicking the Ohm symbol in the atty setting page remeasures your resistance. 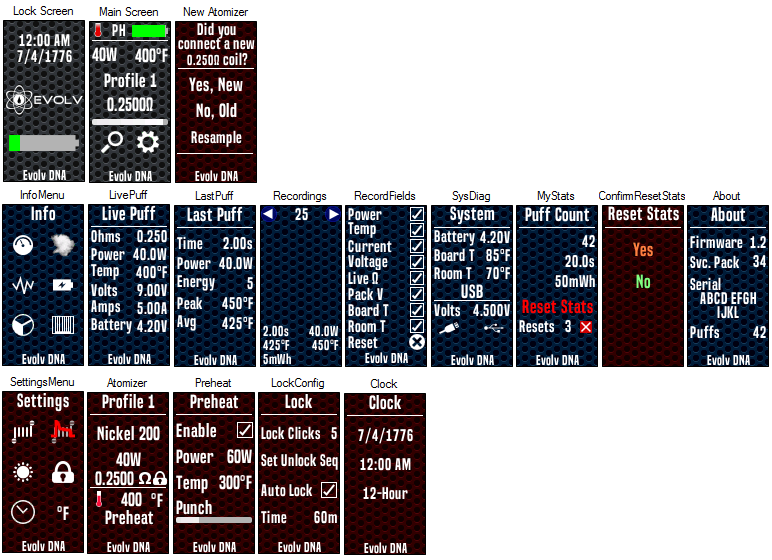 Temp is swamped for voltage on the main screen if temp protection is turned off or you have a non-temp sensing coil. On the recording screen if you click the number you are taken to the most recent puff and if you click on the graph you are take to the field selection screen. Most icons you can select will show some text in the status field saying what they do. In the photos the 1st is when preheat is on, 2nd is preheat off, 3rd is dropped out of temp protection. 4th is TP-enabled=false, 5th is TS-Material=false. atty\temp-protect-enabled=false as the condition for showing the off image. atty\temp-sensing-material=false also for showing the off image.